In many ancient civilizations , the tattoo had a sacral meaning. In Ancient Egypt they were struck on the body before performing a mysterious ritual. In our time, a figure eager to decorate their body most young modern people. Tattoo as a means of expressing his own "I" as a symbol that means something to you personally. 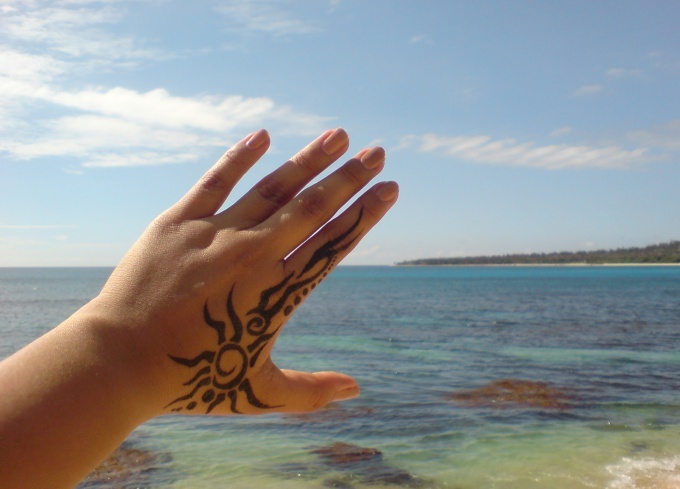 The easiest way of drawing, which you can learn at home is tattoo henna. In order to apply the tattoo you need to prepare a special solution of henna. Start with black tea and a small Cup, measure out 2 tablespoons of tea and pour boiling water. Wait a few minutes until the tea brew, then get a strong infusion, allow it to cool. Then take the black henna, measure 4-6 tablespoons, mix with tea. Then take half a small lemon and squeeze it in a solution of henna and tea. Mix thoroughly. You should get not too thick and not too liquid consistency, which should be allowed to stand for 24 hours. While the solution will be to infuse, go online, type in search: "tattoo", go to images and select any image. To satisfy you, choose a simple pattern, black in color, which could be cut out of paper. Then print the pattern on printer. Fold a sheet of paper and cut inside to make a stencil. Once the solution rises, prepare the necessary for printing supplies. Clean the pad surface on the skin where you want to apply the tattoo. Place for tattoo is better to get rid of hair, so the figure will fall evenly. Then attach the stencil to the skin, take a thin brush, previously dipped it in the solution, and fill the space inside the stencil. After you have applied the required amount of henna, let it dry, this will take about an hour. Then rinse the henna and boldly tell your friends that got a tattoo, trust me, no one will doubt. In art stores you can buy special henna for tattoos that will last much longer on your body and the color it will be brighter. The picture can be applied independently without the stencil. Don't be afraid to improvise! To the color tattoo has been a busy year put the solution in refrigerator for a few hours. Prepare a special jar, it should be not very large and with a lid so you can reuse the solution.